Marathon Modular is a division of Marathon Group Pty Ltd. A Family owned Business that has been in the Building industry for over 30 years and have a combined 150 years of building experience. Marathon Modular has earned the reputation for the construction of complex structures in seemingly impossible destinations, that also withstand the most demanding weather conditions. At Marathon Modular, our knowledge and experience enable us the ability to design and construct a variety of customized modular buildings including architectural commercial buildings, specialized schools and many more complex structures. The team at Marathon Modular are passionate and dedicated in our aim to offer design satisfaction, value and simplicity in our client’s experience from consultation through to design and construction stages. Our team are also the most integral part of our operations and are vital to the success of each project. Our focus is on listening to the customer, offering complete services and delivering high quality modular buildings on time, innovatively and professionally. Our close collaboration with our clients, architects, engineers and subcontractors are key to the streamlined success of our projects. In the near future we will have a new Head Office, Showroom and Manufacturing Plant as shown above, we look forward to expanding business and employment opportunities. 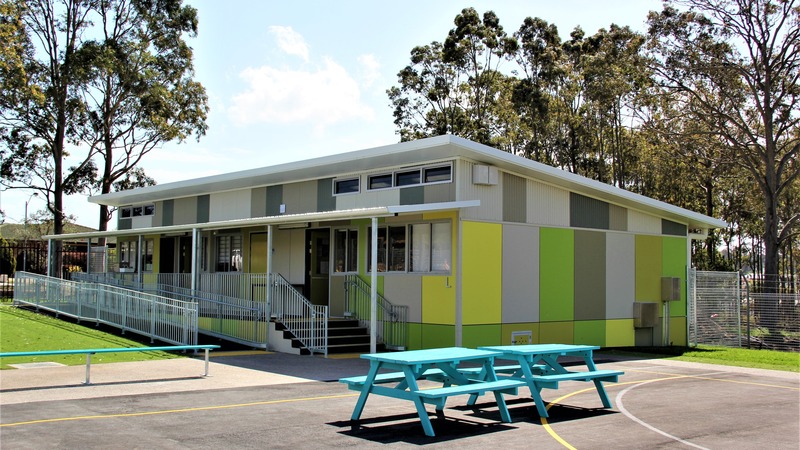 Modular prefabricated buildings have the same custom look sought after in traditionally designed and built schools but can be designed and delivered to the site in half the time. The cost savings with this accelerated time schedule can be significant. More accuracy and streamlined quality construction is hugely beneficial to schools working with strict calendars and timelines. Modular construction is built to the exact same codes as site built structures. Being built in a controlled warehouse this means that along with higher quality management and less onsite activity there is less disruption and waste. Once constructed modular buildings are indistinguishable from other construction. Do you need a building with a quick turnaround time? Ask us how we deliver our projects 40% faster. DESIGN PROPOSAL – Marathon Modular supply a proposal with the collaboration of your ideas for your project. PLANS/DRAWINGS- Our in-house Architects/Designers assist in the production of plans and drawings for your project. CONTRACT- A contract agreement is supplied to outline the detail and sale agreement. CONSTRUCTION- Construction of your project is initiated and completed at our quality-controlled manufacturing plant. DELIVERY/INSTALLATION- A smooth delivery to your site by our preferred haulage company, followed by installation on site. COMPLETION- On conclusion of your finished project an official handover is completed on site.